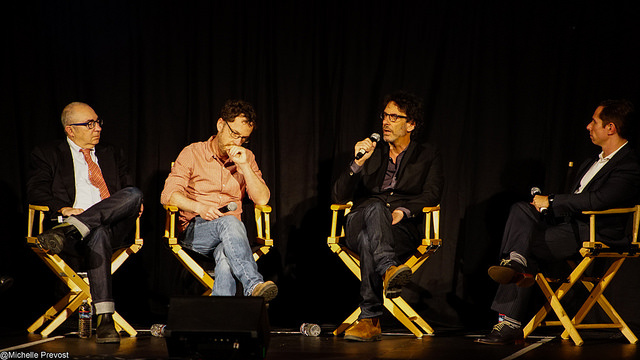 How does a panel discussion on the films of the Coen Brothers sound? That's what we have planned for Fall 2016 on Thursday, October 27 at 7 p.m., in the Student Community Center Boardrooms A, B, and C! 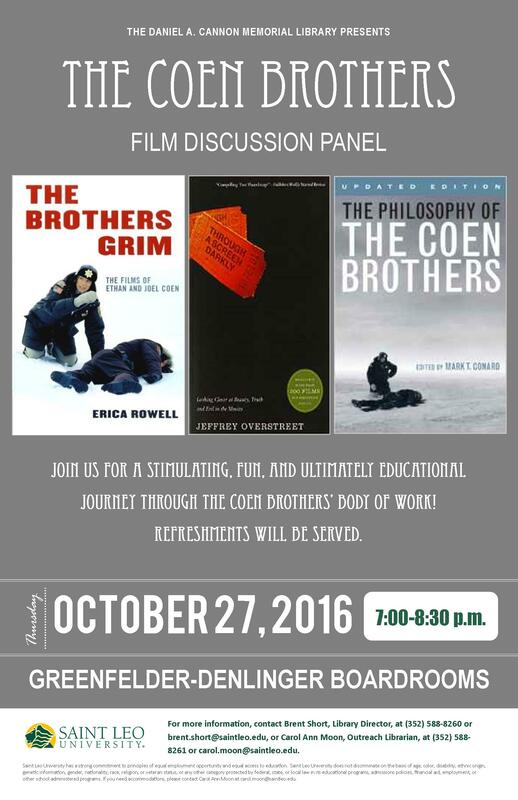 Also, SLU TV Channel 96 will air Coen Brothers' movies the week before the panel, and Dr. Patrick Crerand will host a live showing of True Grit on Tuesday, October 18 at 7 p.m., in the SCC Boardrooms. You won't want to miss any of these events! In 2008 No Country for Old Men won the Academy Award for Best Picture, adding to the reputation of filmmakers Joel and Ethan Coen, who were already known for pushing the boundaries of genre. They had already made films that redefined the gangster movie, the screwball comedy, the fable, and the film noir, among others. No Country is just one of many Coen brothers films to center on the struggles of complex characters to understand themselves and their places in the strange worlds they inhabit. To borrow a phrase from Barton Fink, all Coen films explore "the life of the mind" and show that the human condition can often be simultaneously comic and tragic, profound and absurd. 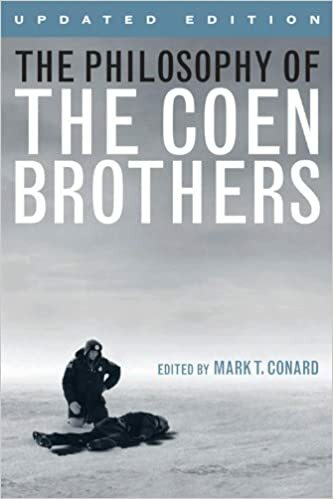 In The Philosophy of the Coen Brothers, editor Mark T. Conard and other noted scholars explore the challenging moral and philosophical terrain of the Coen repertoire. Several authors connect the Coens' most widely known plots and characters to the shadowy, violent, and morally ambiguous world of classic film noir and its modern counterpart, neo-noir. As these essays reveal, Coen films often share noir's essential philosophical assumptions: power corrupts, evil is real, and human control of fate is an illusion. In Fargo, not even Minnesota's blankets of snow can hide Jerry Lundegaard's crimes or brighten his long, dark night of the soul. Coen films that stylistically depart from film noir still bear the influence of the genre's prevailing philosophical systems. The tale of love, marriage, betrayal, and divorce in Intolerable Cruelty transcends the plight of the characters to illuminate competing theories of justice. Even in lighter fare, such as Raising Arizona and The Big Lebowski, the comedy emerges from characters' journeys to the brink of an amoral abyss. However, the Coens often knowingly and gleefully subvert conventions and occasionally offer symbolic rebirths and other hopeful outcomes. At the end of The Big Lebowski, the Dude abides, his laziness has become a virtue, and the human comedy is perpetuating itself with the promised arrival of a newborn Lebowski. The Philosophy of the Coen Brothers sheds new light on these cinematic visionaries and their films' stirring philosophical insights. From Blood Simple to No Country for Old Men, the Coens' films feature characters who hunger for meaning in shared human experience -- they are looking for answers. A select few of their protagonists find affirmation and redemption, but for many others, the quest for answers leads, at best, only to more questions. In 1984 Joel and Ethan Coen burst onto the art-house film scene with their neo-noir Blood Simple and ever since then they have sharpened the cutting edge of independent film. Blending black humor and violence with unconventional narrative twists, their acclaimed movies evoke highly charged worlds of passion, absurdity, nightmare realms, and petty human failures, all the while revealing the filmmakers' penchant for visual jokes and bravura technical strokes. Their central characters may be blind to reality and individual flaws, but their illusions, dreams, fears, and desires map the boundaries of their worlds worlds made stunningly memorable by the Coens. In The Brothers Grim: The Films of Ethan and Joel Coen, Erica Rowell unmasks the filmmakers as prankster mythmakers exploiting and subverting universal storytelling modes to further what seems to be their artistic agenda: to elicit laughs. Often employing satire and allegory, the Coens' movies hold a mirror up to American society, allowing viewers to both chuckle and gasp at its absurdities, hypocrisies, and foibles. From business partnerships (Blood Simple, The Ladykillers) to marriage (Intolerable Cruelty) to friendship and ethics (Miller's Crossing), the breakdowns of relationships are a steady focus in their work. Often the Coens' satires put broken social institutions in their cinematic crosshairs, exposing cracks in ineffective penal systems (Raising Arizona; O Brother, Where Art Thou? ), unjust justice systems (The Man Who Wasn't There), a crooked corporate America (The Hudsucker Proxy), unnecessary wars (The Big Lebowski), a tyrannical Hollywood (Barton Fink), and the unbridled, fatuous pursuit of the American Dream (Fargo). While audiences may be excused for missing the duo's social commentary, the depth and breadth of the brothers' films bespeak an intelligence and cultural acuity that is rich, highly topical, and hard to pigeonhole." In the style of a cinematic travel journal, film columnist and critic Jeffrey Overstreet of Christianity Today and lookingcloser.org leads readers down paths less traveled to explore some of the best films you've never seen. Examining a feast of movies, from blockbusters to buried treasure, Overstreet peels back the layers of work by popular entertainers and under-appreciated masters. He shares excerpts from conversations with filmmakers like Peter Jackson, Wim Wenders, Kevin Smith, Scott Derrickson, producer Ralph Winter, and stars like Elijah Wood, Ian McKellan, Keanu Reeves and the cast of Serenity, drawing "war-stories" from his encounters with movie stars, moviemakers, moviegoers and other critics in both mainstream and religious circles. He argues that what makes some films timeless rather than merely popular has everything to do with the way these artists--whether they know it or not--have captured reflections of God in their work. Through a Screen Darkly also includes a collection of reviews, humorous anecdotes and on-the-scene film festival reports, as well as recommendations for movie discussion groups and meditations on how different films echo the myriad ways in which Christ captured the attention and imagination of culture.